Sikkim culture tour is unique tour itinerary gives visitors complete over viewing of the Himalayan destinations that Eastern Himalayas has to offer. Though fast changing, Its uphold the blend of being very much in the Himalayas. Darjeeling-The British Retreat during Colonial Raj and Sikkim the remains of the lost Kingdom. It facilitates to explore the Unexplored. Want to explore the tribe of north east India and their culture? 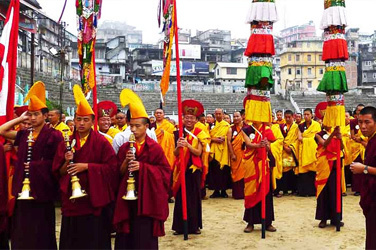 Then take a Sikkim culture tour which will take you through the cultural heritage of the north eastern state. Nowadays people from many other Indian states and neighboring countries like Burma, Tibet, Bhutan and Nepal have entered the state, this is why the state is hosting a multi ethnic population. The first thing that you would notice during the cultural tour of Sikkim is that the majority of population follows Buddhism. The reason is very clear because years ago Sikkim was a Buddhist kingdom. Hence the state supports Buddhism to the full extent. The monasteries standing in the state are the largest proof of the devotion of the Sikkimese towards the Buddhist cult. The cultural tour in Sikkim kicks off from the state capital Gangtok. If you are tracing the cultural roots of the Sikkim people, then visit the Rumtek Monastery. In the vicinity you can check out the various Thankas, Ganesh Tok and also the Namgyal Institute of Tibetology. Day 01 : ARRIVAL DELHI FLY TO BAGDOGRA AIRPORT / BHADRAPUR AIRPORT. will be met by our office Executive who will assist you to board your vehicle to Gangtok (130 kms / 4hrs). Check in and over night at Hotel. Go for a half day sightseeing covering Rumtek Monastery, Droul Chorthen, Research Institute of Tibetology, Directorate of Handicraft & Handloom, Flower Show, Enchey Monastery & Nam Nam View Point. Overnight at Hotel. This is a day excursion to Tshangu Lake (departure in the morning)- situated at a height of 3,780 Mts. with an average depth of 50 ft. The cool water of the Lake is perfectly attuned with the scenic beauty around. Return Back to Gangtok. Overnight at Hotel. Today you go for a Full day sightseeing covering Rimbi Waterfalls, Rimbi Hydel Project, Khecheopari Lake & Kanchenjunga Falls. Back to Hotel for Lunch. After lunch you cover Pemayangtse Monastery, Changay Falls, Singsor Bridge & Dentam Village (includes Alpine Cheese Factory). Overnight at Hotel. Here you do the sightseeing of Dello hills, Dr. Graham’s Home, Flower Nurseries, Nature Interpretation Center and Durbin Dara Hills & Jang-Dong-Palriffo Brang. Overnight at Hotel. Airport/IXB AIRPORT / Phuenstholing Bhutan Border. Drop for onwards connection.